While we wait for the lawyers to work out the details surrounding the closing, Fat Property has begun to upgrade and manage a new 38 unit property located 3802 Wipprecht. This property represents our first sizable apartment complex outside of the Midtown/Montrose area. The property is located just north of the Fifth Ward area of Houston, just a few miles from downtown, Heights, Montrose, and other hot areas. So while it’s “close to it all”, we can’t say the location its in is our best. However, it’s perfect for those wanting a large apartment close to everything, for a very low cost. 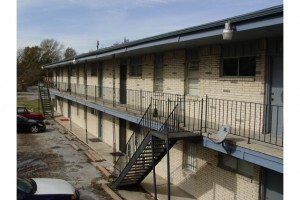 The building consists of 38 units, most of which are closed up and in need of work. In order to jump-start this location we’re renting large 1 bedroom upgraded units for $400/month*. The units are very nice and our largest 1 bedrooms. We’re putting in new appliances, new paint, new ceramic tile flooring, new ceiling fans, and more. Pretty much new everything — and perhaps it’s overkill for a $400/month apartment but we want to do our best to get a good tenant base in there. If this property were just a few miles south/west, they’d be $1,000/month. If you’d like to apply for a unit, you know where to go. * $400/month rent is for those who have applied in advance and pay a full month rent as a deposit. Otherwise rent is $450/month. Picture is of the building today. We plan on totally repainting the property as part of our upgrades.